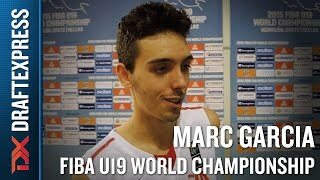 An interview with Spanish guard Marc Garcia at the 2015 FIBA U19 World Championship in Crete. -Smooth athlete. Very fluid and mobile. -Good instincts as a scorer and shot-creator. -Struggling badly with his jump-shot as of late. 29% for 3 in the ACB this season. 30% at this tournament. In a huge funk from beyond the arc in past year plus. -Poor defender. Lacks toughness and strength. Intensity level leaves a lot to be desired. Doesn't close out with urgency. Doesn't fight through screens. Outlook: Creative shooting guard with nice scoring instincts. In the midst of a difficult period, coming off a tough season in the ACB. Seems to have lost much of his swagger which made him such an intriguing player earlier in his career. Frame needs to improve substantially. Still flashes signs of intrigue with his ability to draw fouls, get in the passing lanes and make an occasional jumper, but needs to improve his defense, shooting consistency and become a much better finisher inside the arc to reach the tremendous potential he showed earlier in his career. Rights are owned by Barcelona, so will almost certainly be on loan again next year. -What kind of defender can he become? Outlook: Kind of a Spanish Nik Stauskas. Made a very strong impression in Mannheim. Appears to have grown, filled out physically, and improved considerably in the past 12 months. Clearly one of the best young prospects in Europe. Already producing at a very high level in the Spanish second division (LEB Gold), averaging 11 points in 24 minutes. Needs to continue to work on his body, keep improving defensively. -Needs to improve passing skills and ability to create for others. Only dished out two assists in 231 minutes. Outlook: Exceptionally talented young scorer. Looks like a baby but has a killer's mentality. Comes on the floor looking to put up points, but doesn't force the issue and plays within a team concept. Lack of strength affects everything he does at the moment, but he just turned 17 two months ago so he still has plenty of time to work on his frame.